From the shooting of a Secret Service agent in the wilds near Hesperus to the grave misfortune"? of Kid Adams, a not-so-successful highwayman, these tales from the lofty heights of the San Juans are packed with mystery, pathos and fascinating historical details. Mined from the frontier newspapers of Ouray, San Juan and La Plata Counties, these stories tell of range wars, desperadoes and cattle rustlers, lynchings, ill-tempered ranchers with trigger fingers and women fed up with their husbands. There are famous and infamous newsmen, wild stagecoach rides, scapegoats and stolen lands. 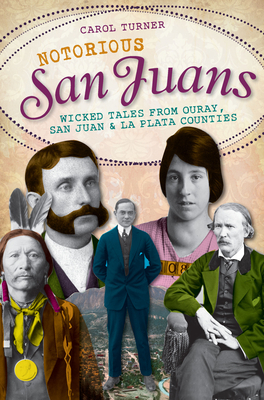 Carol Turner's Notorious San Juansoffers a rowdy ride through the region's not-so-quiet history.